There were tears when James and Marta Rogers were told their tiny first-born daughter was deaf and there will probably be tears again when she starts Prep at a mainstream school later this month. 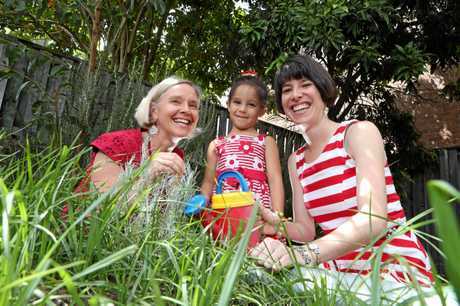 It has been a remarkable first five years for Lucia, who'll start school ahead of her age milestones thanks to a Queensland program that is a world leader in providing services and support to deaf children and their families. It was a standard screening test for newborns that picked up a problem with Lucia's hearing. At first her failure to respond was thought to be linked to her small size - she was 2.5kg at birth. Her diagnosis was confirmed at just two months old, setting the Rogers family on a journey they never imagined they'd be taking. For many parents, it's the unknown that magnifies their fears - so it's comforting to hear a story of a well-oiled system that provides a clear pathway for children and their families to access the services they need. Within a fortnight Lucia was fitted with hearing aids. It's now known sound should be introduced as soon as possible to babies to allow the crucial early wiring of auditory processing pathways in their developing brains. James shows the moving video of Lucia experiencing sound for the first time in an audiologist's rooms. Her eyes open wide in wonder and delight, she smiles and gurgles, her arms and legs jolt with excitement. It is, quite simply, beautiful to watch. 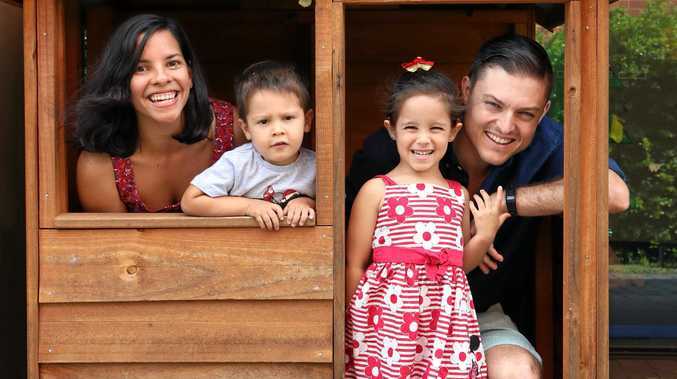 Two weeks later, the family were at the Hear and Say Centre at Varsity Lakes, one of five in Queensland dedicated to helping deaf children access sound through technology and equipping them with the gift of language. In 2017, the centres recorded an incredible 100 per cent success rate in preparing children to enter mainstream schools through their Early Intervention Program. In a world where so much attention is given to services that aren't working, Hear and Say has been quietly getting on with its mission. 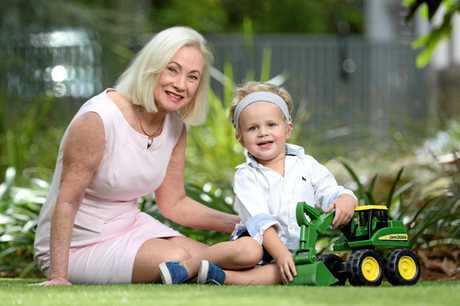 The centres were founded by Brisbane speech pathologist Dimity Dornan who was inspired by the progress of auditory-verbal programs in teaching deaf children to speak in other parts of the world and started working with six children in her husband's physio rooms in 1992. Through centres in Brisbane, the Gold Coast, Sunshine Coast, Townsville and Toowomba, Hear and Say programs have helped more than 9000 children. In the past, many deaf children were taught sign language which effectively restricted much of their communication to those who also knew signing. The Hear and Say philosophy is to teach children - and their families - the skills that will help them not only to talk but to flourish in the real world. The centre's clinical manager Jessica Balfour-Ogilvy is one of only a handful of certified listening and speaking speech pathologists in Australia. The Varsity facility has two. "We work in partnership with families,” she says. "We teach them the skills and guide them so they can work at home with their children every day. For Marta and James, it meant starting "radio commentating”, the habit of describing to Lucia everything around her. "She can't hear what's far away so when you see a truck, you say 'That truck goes brmmm brmmm' so you can establish that connection for her,” James says. It's also led to some amusing encounters. The Hear and Say techniques also reward children for making sound. The chatty home environment has had the added benefit of advancing their second-born Daley's verbal skills. The two-year-old is just as much at home at the Hear and Say Centre as his sister, with it having been part of his life as well. "He understands Lucia needs her hearing aids,” James says. Marta and James later learned Lucia's hearing impairment is genetic, with both James and Marta carriers of a set of genes linked to hearing impairment in female children. "The geneticist was quite amazed,” James says. "I'm from Australia and Marta comes from El Salvador (she migrated to Australia with her family when she was five). It's not a question they dwell on. Their focus has been on giving Lucia a normal childhood experience. Hear and Say has been there to provide support and advisory services to others in Lucia's life as well, including her day carer and later her kindergarten. Last year, Lucia's kindy took part in Hear and Say's annual fundraising initiative Loud Shirt Day that also aims to boost awareness of people with impaired hearing. "They explained to the class how the teacher wears an FM (a microphone device that transmits directly to hearing aids) that helps Lucia to listen to what the teacher says,” Marta says. "They said how important it was for everyone to try to be quiet when the teacher is speaking because it helps Lucia to understand better. The next step for Lucia is what's called the Rocket program, designed for children entering Prep to help them advocate for themselves at school and take ownership of their situations. "We teach them the technology belongs to them, it's their responsibility, and that they have to speak up for themselves,” Jessica says. The path through school will no doubt present its challenges, as it does for all children, but James and Marta are heartened Lucia's Prep teacher at Hillcrest Christian College has already accessed Hear and Say training off her own to bat to better equip her to help Lucia in the classroom this year. The centres are also welcoming the National Disability Insurance Scheme rollout that will enable them to continue providing services to their graduates throughout Prep and perhaps beyond. Since opening its doors at Varsity Lakes in 2005, the centre has had a spike in enrolments, with 34 new children on its books this year. Population growth has played its part but no doubt Hear and Say's reputation in the sector is also a contributor. "We're very fortunate to have the system we do in Queensland where the services are streamlined, there's government funding and we work with each other,” Jessica says. That said, only 40 per cent of Hear and Say funding comes from the government. The centres must rely on philanthropy and their own fundraising to continue their work, which includes ongoing research, access for rural and remote children, hearing screening programs for school-aged children and advocacy work. For families like Lucia's the centre has been the guiding light for their journey. "Hear and Say has been involved from the start,” Marta says. "Once you're in the system, it feels like everything is taken care of. It's such a weight off your shoulders.